Jose Mancinas, 21 yrs old, Pomona Resident. Male, 29 yrs old. Name withheld. On March 9th, 2019, at approximately 1:45PM, officers were dispatched to the area of the 1300 block of east Mission Blvd in reference to two victims who had been stabbed. Officers located the victims who were suffering from multiple stab wounds. They were taken to a local hospital where one of the victims succumbed to her injuries. The male victim is currently being treated for his injuries and is expected to survive. Detectives were able to locate video surveillance footage showing the suspect prior to the attack. 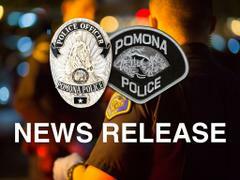 A Crime Scene Investigator, who was at the crime scene, was driving back to the Pomona Police Station when he observed a male, who matched the suspect description, walking on the sidewalk several blocks away from the crime scene. Officers arrived and immediately took the suspect into custody. They found items on the suspect that link him to the attack. The suspect was transported to the Pomona Police Station where he was ultimately processed and booked for 187PC-Murder, & 664/187PC-Attempted Murder. The suspect was identified as Jose Mancinas. LOCATION: 1400 E. Mission Blvd. Officers responded to the above location and discovered two victims suffering from stab wounds to their upper torso. Both victims were transported to a local hospital in serious condition. The suspect was observed fleeing on foot just prior to officers arriving on scene. Detectives from the Major Crimes Unit are en route to assist with the investigation.